People often look for DHT blockers when trying to fight hair growth issues and trying to keep their full head of hair; we got news for you, saying that DHT is the root cause of hair falling out is the biggest myth ever created – although there is some truth to it, part knowledge can be dangerous! DHT is a hormone that causes inflammation in the scalp; many hormones can cause inflammation in various areas of the body – its known that blood issues (hormone) are what can cause a lot of inflammation, as well as your diet and your stress levels. Guess what? Inflammation is the real cause of hair to actually fall out! Yes, you read it right – saying that DHT causes hair thinning is like saying the person sitting in the driving seat, pushes the car to move! Its not, its the combustion inside the car taking place, which then pushes the engine to create kinetic energy to create a movement, which then, the driver directs and controls. This is very important to understand – Inflammation is not always visible; just because you checked your scalp, does not mean inflammation will be visible – sometimes inflammation can happen at a smaller scale, inside the hair follicles, which then stop producing hair. How do you stop inflammation in the scalp so that you can stop hair loss once and for all? 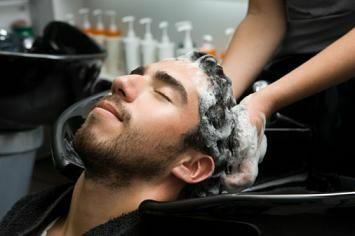 There are many natural ways to do this; one of them is by adding the Taoist soap in your weekly regime – massaging it into your scalp and leaving it on for up to 5-7 minutes would help stop inflammation at a cellular level – you don’t need to apply it to your hair itself, and just the scalp (although its okay if you do). But only employing one method of stopping inflammation on your scalp is like trying to fix a car with one tool! (I know its a funny example, but using it for the sake of simplicity). So it is better to employ many methods of stopping inflammation and use them in combination – changing your diet to greens rich food helps stop inflammation (Kale and spinach!) – exercising regularly (aerobics) as well as going for long walks. The reason hair loss is more common in todays time is because we have changed our behaviour significantly – work is mostly sitting down, life is easily more stressful if one is not careful – so we need to be conscious of these things to help keep ourselves healthy. Stay tuned to see more updates on how to handle hair loss and finally help stop your hair issues once and for all.